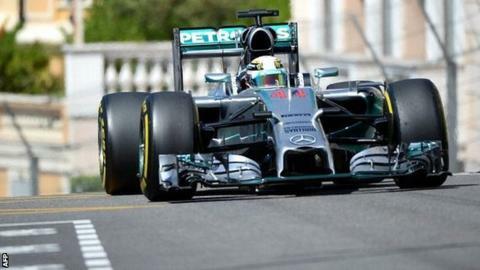 Mercedes driver Lewis Hamilton set the fastest time in final practice at the Monaco Grand Prix narrowly ahead of Red Bull's Daniel Ricciardo. Hamilton was just 0.05 seconds quicker than the Australian, who headed the second Mercedes of Nico Rosberg and Sebastian Vettel's Red Bull. The Ferraris of Fernando Alonso and Kimi Raikkonen were fifth and sixth, separated by just 0.04secs. Sergio Perez was seventh, ahead of Force India team-mate Nico Hulkenberg. The Toro Rossos of Jean-Eric Vergne and Daniil Kvyat completed the top 10, ahead of the McLarens of Kevin Magnussen and Jenson Button, and the Williams drivers Valtteri Bottas and Felipe Massa. The Mercedes drivers were a second clear of the two Red Bulls after the drivers had completed their race preparation in the first 40 minutes of the session, with Rosberg 0.5secs ahead of Hamilton. But on the faster super-soft tyres at the end of the session Hamilton turned the tables on his team-mate, beating the German by 0.116secs. Ricciardo continued his strong run of form and was 0.376secs clear of Vettel. All the top drivers struggled to get clear laps as the 22 cars fought for space around the claustrophobic street circuit under pristine blue skies. The traffic problems are being heightened by the tyres Pirelli have brought here, which many drivers have complained are too hard and are taking more time than usual to get up to working temperature. All the drivers from the top three appear to have more time in their cars, making it difficult to predict the outcome of qualifying, which starts at 13:00 BST. Mercedes still appear to be the team to beat but it would appear as if Red Bull may run them closer than in previous races, and Ricciardo is showing the sort of form that suggests he could beat at least one of the silver cars for a place on the front row. The Australian's fastest time came at the start of an eight-lap run, so he can clearly go faster if fuelled for a shorter time out on track. Meanwhile, with just three points separating Hamilton and Rosberg at the head of the championship, the intensity of the battle between the two has notably increased at this blue riband event, with Hamilton implying he feels he is hungrier to win the title than his team-mate. Rosberg has not yet responded but will be determined to prove him wrong.